Posted February 24, 2011 in Upcoming Kirby. 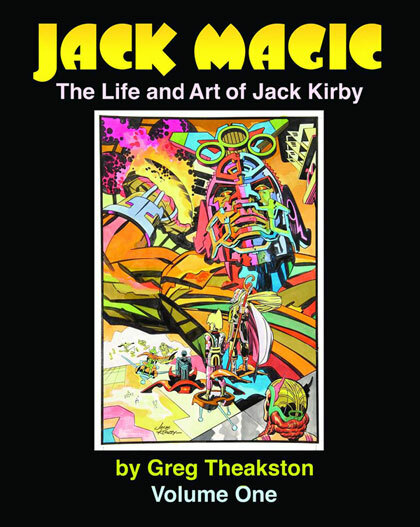 Greg Theakston’s biography of Jack Kirby, JACK MAGIC, previously scheduled as a one-volume edition in 2008, is now being solicited as a 2-volume work, with the first scheduled to come out later this year from Theakston’s Pure Imagination. by Greg Theakston & Jack Kirby The long-awaited biography of Jack Kirby, The King of Comics! Written by Greg Theakston, Jack’s workmate and personal historian, it’s a detailed study of Kirby’s life and career. Included are extensive quotes from Kirby, Joe Simon, Will Eisner, and many more. Profusely illustrated with classic art and family photos.